Abstract. Over the past few decades, the geographical distribution of emissions of substances that alter the atmospheric energy balance has changed due to economic growth and air pollution regulations. 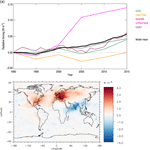 Here, we show the resulting changes to aerosol and ozone abundances and their radiative forcing using recently updated emission data for the period 1990–2015, as simulated by seven global atmospheric composition models. The models broadly reproduce large-scale changes in surface aerosol and ozone based on observations (e.g. −1 to −3%yr−1 in aerosols over the USA and Europe). The global mean radiative forcing due to ozone and aerosol changes over the 1990–2015 period increased by +0.17±0.08Wm−2, with approximately one-third due to ozone. This increase is more strongly positive than that reported in IPCC AR5. The main reasons for the increased positive radiative forcing of aerosols over this period are the substantial reduction of global mean SO2 emissions, which is stronger in the new emission inventory compared to that used in the IPCC analysis, and higher black carbon emissions. How to cite: Myhre, G., Aas, W., Cherian, R., Collins, W., Faluvegi, G., Flanner, M., Forster, P., Hodnebrog, Ø., Klimont, Z., Lund, M. T., Mülmenstädt, J., Lund Myhre, C., Olivié, D., Prather, M., Quaas, J., Samset, B. H., Schnell, J. L., Schulz, M., Shindell, D., Skeie, R. B., Takemura, T., and Tsyro, S.: Multi-model simulations of aerosol and ozone radiative forcing due to anthropogenic emission changes during the period 1990–2015, Atmos. Chem. Phys., 17, 2709-2720, https://doi.org/10.5194/acp-17-2709-2017, 2017.